eSales Cloud DMS Solution- Distribution Management Solution. eSales Cloud DMS distribution management system is a software solution that enables enterprises to improve their distribution system, keep track of all of their business activities in a prompt and easy way, optimize their sales system through retail outlets, keep their distribution channels and sales staff under control, minimize risks, increase business performance and maximize profitability. With eSales Cloud DMS solution, enterprises can grasp market situation to design and implement proper policies. Many enterprises are unable to control the inventory of their distributors and stores to optimize their supply chain and apply proper sales strategies, to take initiative in supply and sale of products, especially the products with short expiry date, or to control flow of goods in their supply chain. How to perform visual management and optimize sales routes by product line, area, and sales staff to maximize the coverage? How to control overlapping sales territories and sales in unappointed areas? How to supervise and manage division, merger and change of distributors, sales staff, and product lines? Despite generous promotion budget, the promotion efficiency remains limited. It’s because of the drawbacks arising in the implementation process that lead to waste and losses. Enterprises find it difficult to switch from “sell-in” to “sell-out” promotion strategy for they fail to keep complicated promotion programs under control, plus the budget varies in different regions and gathering claims at the end of each program is another matter of concern. Managers are always under the pressure of how to meet the sales targets set. Their major concerns are how to obtain enough information to deploy sales programs effectively so as to increase sales by brand, area, and channel; and how to employ different methods in an efficient way to boost performance of their sales staff and consumption (sell-out, off-take) at stores and of end consumers? Does the sales staff work at 100% or more capacity? How to design the KPIs that really work and give motivation to the sales staff to have better performance? Is the sales team closely monitored and well trained? How to control this? Do sales team of company work with 100 percentage productivity or more? How to establish and control KPI to motivate them and increase productivity working? Are sales team be well followed and trained enough selling skills? How to control that? The problem of "virtual" figures is quite popular in sales and distribution fields. Virtual figures about points of sale, sales, promotion, inventory, etc. are always the top concerns of managers for these unreal figures adversely affect their decision making. The situation that an employee quits his/her job and brings along true data is not rare nowadays. It is not easy at all to manage a sales team with hundreds or thousands of people in an efficient and principled way. The matter is how enterprises can motivate their sales force to comply with policies, procedures, and regulations in an active and voluntary manner? High sense of compliance is a driving force of sales effectiveness and higher coverage. As the consumer market develops ever more strongly, distribution channels get ever more diverse, from traditional channels such as GT to the modern ones such as MT, Horeca, Medical, B2B, KA, online. What really matters to managers is how to build an effective sales and distribution ecosystem that enables unification and measurement of multi-channel distribution data in service of data aggregation and making of wise decisions, policies, and strategies for each channel. In the modern and multi-channel distribution model, enterprises must face and process data from different sources and in different forms. How to design a consistent data model that can well handle the typical processes and characteristics of each channel and each system, ensure thoroughness, uniformity and timeliness of information? 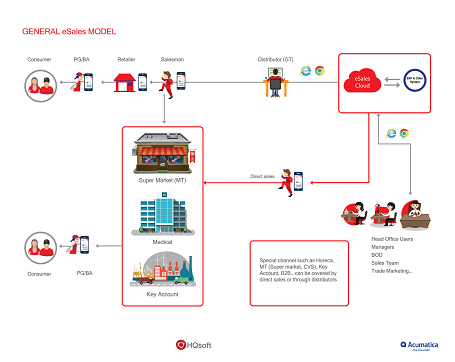 How to build an efficient distribution and sales ecosystem for the multi-channel model in the modern consumer market? With well-designed processes and functions that support every user in the system, the solution will give enterprises a complete DMS data set that consists of data about the market, points of sale, inventory, sell-in, sell-out, promotion, display, POSM, etc. and limits and prevents change of cooked data about sales. With the support of true data, enterprises can make sound decisions and carry out sales strategies in a more efficient way. Sales targets are set and allocated properly to each salesman and point of sale for each product line and SKU. Thanks to this, enterprises can pursue different strategic directions and measure the effectiveness of each of them. Promotion programs, from the simple to complicated ones, are managed in the system, which enables enterprises to measure and control their budget as well as implementation of promotion program on every order and at every point of sale. eSales Cloud DMS provides enterprises with true and accurate data that enables them to deploy their sales strategies with proactiveness. With this software solution, enterprises can better adapt themselves to personnel changes in the distribution system and easily add new distributors, new areas for new sales teams. With the help of eSales, enterprises can gain complete proactiveness in their supply chain. The effective deployment and management of sales programs help attract consumers, increase their loyalty, and strengthen cooperation with distributors for it shows them real profits. Apart from that, eSales features functions and procedures that enable close management of product display programs to enhance brand recognition at every point of sale. With automated and optimized workflows that save enterprises considerable time and staff, enterprises can get more customers without having to recruiting new employees. Plus, distribution expenses for promotion, product display, sales programs, POSM, etc. are all strictly controlled in the system, which helps enterprises avoid negative results, budget losses and inefficiency. eSales Cloud DMS was created by HQSOFT team with 20 years of experience in sales and distribution field. The sales and distribution procedures to be applied all take roots from the world leading corporations involved in trading consumer goods and other commodities. HQSOFT team has had years of experience in implementing eSales Cloud DMS projects for many leading corporations and earned trust of large and multinational corporations in Vietnam and in the region. eSales Cloud DMS has been successfully integrated with major systems such as SAP, Oracle, MS AX, MS, and NAV. The Call Center System ranging across the country and the region has contributed a part to sustain the stability of the software and consolidate large and multinational customers’ trust in HQSOFT. In response to today's increasingly sophisticated multi-channel consumer market trends, eSales Cloud DMS is designed with eSales EcoSys framework that prepares enterprises for the multi-channel sales and distribution ecosystem. With eSales EcoSys framework, eSales Cloud DMS solution will be well adapted to all distribution channels, integrate all related objects into a single system. In other words, it’s a solution that provides aggregated data to all sales channels. In today's trends, the application of Big Data and Artificial Intelligence (Big Data & AI) technologies to business management and decision making becomes an efficient support tool for enterprises. eSales Cloud DMS is no exception. Our R & D team has diligently conducted research to apply Big Data & AI. And eSales Cloud DMS was brought to life for this reason. This software solution helps enterprises handle and make decisions about complicated issues concerning analysis of massive business data up to tens of millions of GB and data archives for every SKU or point of sale accumulated for years. Apart from that, owing to Big Data & AI in eSales Cloud DMS, enterprises will spend less time identifying display images or analyzing images at points of sale. With the view to giving enterprises access to eSales Cloud DMS - an advanced and modern distribution management solution with procedures and features of international standard but reasonable cost, HQSOFT offers different license options. Enterprises can choose either on-premise option or subscription option to pay monthly fee based on the number of actual users. If enterprises choose the software subscription model, they won’t have to care about the cost for infrastructure investment and maintenance. Allow enterprises to manage promotional activities and budgets in an efficient way. Automatic ordering feature. With the features of automated ordering process, automatic ordering, automatic check and allocation of inventory. Keep business targets under control. Enterprises can easily set different KPIs like Coverage, LPPC, ASO / UB, key products, etc. Product display management (merchandising). The software has the features of managing the whole product display process in the system, automatically reminding employees of taking photos of the goods displayed whenever they come to stores. Management of point of sales materials (POSM) and investment activities. Specifically, the software is of great help in controlling transaction details, the number of POMS from enterprises to their distributors, from the distributors to stores, POSM status, etc. Digital map solution for Mobile Computing Platform (MCP) and market coverage analysis. Mobile App solution that enables managers to easily control sales operations as well as business activities via mobile devices. Delivery Mobile App solution that helps enterprises transport as many products as possible at the fastest rate and with lowest cost, automatically proposes delivery plans and has its configuration changed easily in different circumstances. Allow managers to control the performance of PGs (Promodiser), regulate off-take based on sales to end users at stores and supermarkets. Management of activities at stores and chain of stores to ensure promotional activities, ordering, and product display, etc. with the view of maximizing profits, reducing costs, building a strong customer network.